Our water pens are made from high quality materials with durable plastic tubes, caps to protect each brush tip from damage and breakage. The strong plastic pouch will help protect them from damage. They have been tested to out-perform cheaper alternatives. This means that they are made to last longer and will save you money as they will not need to be replaced. 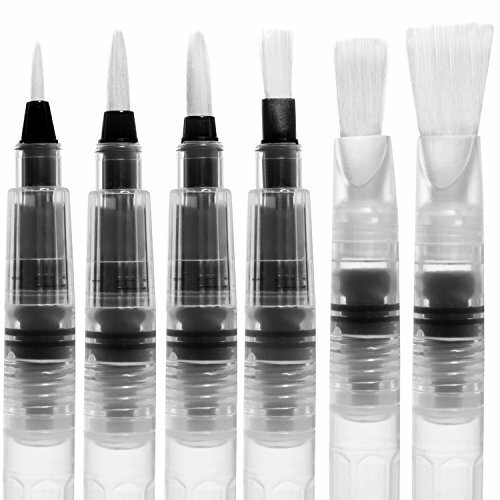 The brushes have soft, long nylon tips in 6 different sizes with 3 round and 3 flat brushes. This means that the tips are secure, paint both fine and broad strokes and have better brush control. They also produce a superior professional finish for your painting. Unlike other products, our water pens have tubes which can be sealed tightly and have no leakage. The Paint Tray provides additional value and convenience for holding paint during painting. The two items work together to compliment painting your art project. Our brush pens contain instructions and are easy to open. They are simply unscrewed and should be filled only to about 80% with water for painting. There are no confusing back to front screw on tubes. This means they save time and you can start your painting or artwork quickly. It also means they are suitable for all ages and ideal for children's art projects. Make a great gift or present. Versatile Water Pens: A set of water pens with paint brush tips ideal for watercolor, acrylic painting, and calligraphy. Can be used with solid color or pigments. Easy to Use and Clean: Unscrew and fill with water only ready for use. Tighten tube and squeeze for consistent water flow. Rinse with clean water to wash brushes when finished. Durable Brushes and Tubes: Squeezable non -leaking tubes. High quality long nylon brush tips and a protective lid. 6 Piece Brush Set: Comprised of 3 round and 3 flat brushes with fine, medium and broad, thick flat brushes in different sizes (1, 2,3,4,7,10). Pack also includes a rectangular 6- hole painting palette tray, reusable storage pouch and instructions. Lightweight Pack: Pack is 7.7 L x 4.5 W x 1.2 H Inches. Individual water brush is 7.4 L x 0.4 W Inches. Light and suitable for big and small hands. View More In Paintbrush Sets. If you have any questions about this product by Markat International, contact us by completing and submitting the form below. If you are looking for a specif part number, please include it with your message. Sale! Reg.$29.99 Now $16.45 Artist Paint Brush Set 15 Different Shapes & Sizes – for Acrylics, Oils, Water Colors and Face & Body Painting. Bonus Palette Knife, Water Color Sponge & Travel Case!